Hockey Guy: Hitchcock stay, so which Blues go? 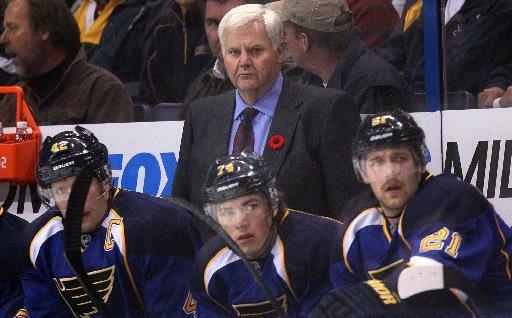 Blues coach Ken Hitchcock will return for the 2015-16 season. Had the Blues fired Ken Hitchcock after still another major playoff disappointment, he would have immediately become the most qualified head coach in the NHL marketplace. The man does have Hall of Fame credentials. So the franchise decided to bring him back with a one-year contract instead -- but only after checking in with Mike Babcock, who ended up jumping from the Detroit Red Wings to the Toronto Maple Leafs for gigantic money. General manager Doug Armstrong seemed guided by one overriding principle: Why fire a coach unless you can find somebody better for the job? But the counter-argument is obvious: Why bring back a lame duck coach and invite message-weary players to quit on him? The latter question will hang over the Blues from the start of training camp. Players groused about Hitchcock this season and failed to play inspired hockey for him during postseason play. How can the same coach get different results next season? That will be a heck of a challenge for Hitchcock. Armstrong can address that issue by freshening up the roster. Top forward prospect Robby Fabbri could bring energy. So could rugged defenseman Todd Bortuzzo, who sat out the playoffs. Defenseman Petteri Lindbohm should be ready to assume a role. Other changes are inevitable, since Armstrong has to clear salary space to secure restricted free agent Vladimir Tarasenko with a massive new contract. That expensive re-signing could make it tough to woo Vladimir Sobotka back from the KHL, assuming he really does have a rock-solid deal in that financially strapped league. Odds are, though, that most of the key Blues will return for next season. And why not? Barring catastrophic injuries, the Blues seem likely to produce at least 100 points again. The core of the team has evolved in the past year, with Tarasenko, Jaden Schwartz, Paul Stastny, Jori Lehtera, Jake Allen, Dmitrij Jaskin and Carl Gunnarsson assuming big roles. Hitchcock should still be fresh to most of these players. Kevin Shattenkirk and Alex Pietrangelo appear to be just breaking out as impact defensemen. There is no need to move them either. Alexander Steen and David Backes are two of the most well-rounded, well-respected forwards in the business. Most contending teams would love to have either player. Neither has a glaring character flaw. So what gives? Defenseman Jay Bouwmeester was a huge disappointment, but his massive contract makes moving him difficult. T.J Oshie seems like an obvious target, given his high trade value, significant salary and unproductive playoff. He also had the temerity to suggest that maybe, just maybe, the team was subjected to information overload. Patrik Berglund had a couple of big playoff moments, but that scarcely helped fans forget his ineffective regular season. As Armstrong looks for ways to create payroll flexibility, Berglund's roster spot would be a good place to start. It would be great to see venerable defenseman Barret Jackman finish his career where it started, but there is no room for sentimentality when a team keeps coming up short in the playoffs. Armstrong could do something much bigger and trade previously untouchable players. Again, the core group of this team is clearly in transition. An interesting summer awaits this franchise now that Hitchcock is back on board to start another season. Smart of Blues to bring Hitchcock back. Now Doug Armstrong needs to take a page from Bob Murray's book and make the tough roster calls. Have to believe Hitchcock was disappointed in Babcock pursuit. But he never let it change his mind about wanting to coach this team. From a player that has played under Hitchcock. "Amazing XO's coach, demanding, but wears on soft guys. Great hockey guy. " Hitch is elite. Blues didn't look fast enough in the playoffs. Big and heavy is great but speed is key. Can Armstrong make right tweaks? Not sure how to read Hitchock back for another year with Blues. Is this a status quo endorsement or is something else going to change? Like, the Blues already tried "get a goalie" gambit w/ Miller. They need something to change heading into next year? Break up Backes/Oshie?